Most incubators aren’t known for their efforts to attack niche markets – except Coinlab. The company, which describes its goal as “building Bitcoin businesses” – has chosen a very unique spot for their incubative activities and is focusing primarily on Bitcoin and Bitcoin related companies. Because of this narrow focus, it’s no surprise that they have only now announced their first incubated company, Alydian. The company aims to be the first “large-scale U.S. Bitcoin mining” solutions provider. Sadly the site is not currently live – the .com URL points to a collection of “Vintage Czechoslovakian Perfume bottles” and the .co address is dead – but presumably it will rent out ASIC mining hardware for a small portion of the proceeds. Why they don’t just mine the heck out of Bitcoin all day long for their own gain is beyond my ken, but that’s what’s up. The Coinlab press release notes that processing power costs $65,000 per Terahash which should result in a profit of $2,800 per day. 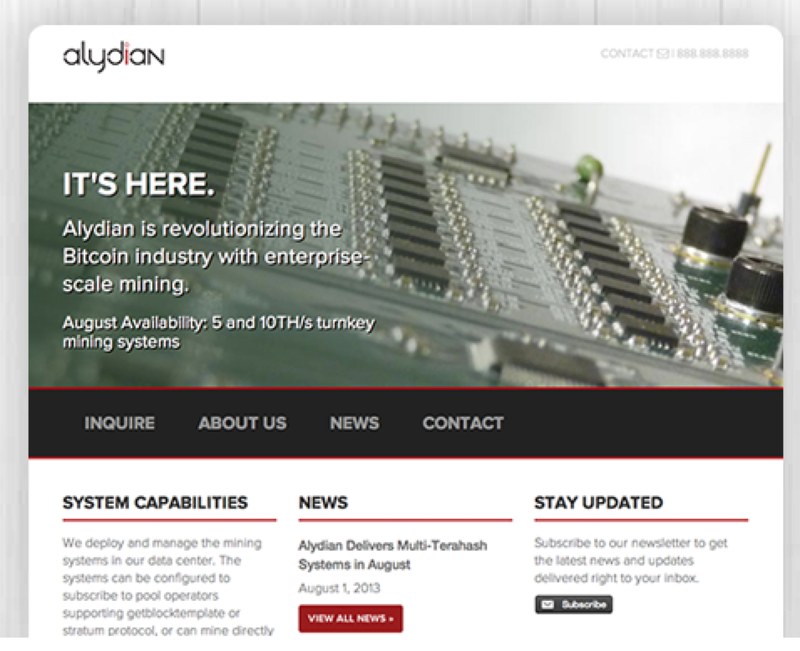 Until this is proven definitively, however, Alydian, like most incubated companies, looks a bit too good to be true. Presumably these initial investments allow for a nice arbitrage opportunity by buying cheap mining hardware and simply keeping the lights on while well-heeled clients drop off checks and take a bit of profit. Coinlab does not bring outside companies into its incubator but instead forms its own companies internally and spins them off, hiring management from their pool of BTC talent. They will build another company this year and a few next year. We are’t renting. We are selling equipment that will be hosted and operated by our team and the purchaser receives all the bitcoins mined by their equipment.The reason why we aren’t hoarding our equipment is because that isn’t good for the industry. We’re trying to help facilitate the growth of an industry, not inhibit it, by building quality fundamental infrastructure for bitcoin.